The theta aurora over Antarctica. Auroral imaging with Dynamics Explorer 1 has identified a unique auroral configuration that can occur when the interplanetary magnetic field is directed northward. This image obtained at 0022 UT on 11 May 1983 shows one of the finest examples available to date of this spatial distribution comprising the auroral oval and a transpolar arc. The arc extends into the polar cap from local midnight, across the polar cap and joins with the auroral oval at local noon. The term theta aurora derives from the striking similarity of this spatial distribution to the Greek letter . Motion of the transpolar arc in the dawn-dusk direction appears to be controlled by the direction of the interplanetary magnetic field along the dawn-dusk direction. In the Northern Hemisphere, the arc moves in the direction of the IMF By component. A long, breath-taking sequence of images showing the growth and decay of a Theta Arc feature first seen with the DESAI. This image sequence occured 8 November 1981 (81/312) from 14:12 UT in the first image in the upper left panel until 17:02 UT in the lower right panel. Each image is separated by approximately 12 minutes. Sun-aligned arcs are auroral features found within the polar cap, as opposed to the auroral oval where the more typical arcs reside. First global image of this phenomenon was reported by Frank et al. (1982); it consists of luminous belt reaching across the polar cap from noon to midnigh (that is why it is also called theta aurora; terms transpolar or polar cap arc are also known). However, first visual observations of such features were by the British Antarctic Expedition already during the austral winter of 1908 (Mawson, 1916). Similarly, first ground-based all-sky-camera observations originate from the International Geophysical Year (IGY) of 1957-1958 (Davis, 1962; Feldstein, 1963). The arc is about a hundred kilometers wide or more, and its luminosity may be comparable to the average emissions within the oval (typically, however, it is less than that). The feature can last for several hours, and it moves slowly across the polar cap in the direction of the IMF By component in the northern hemisphere (Frank et al., 1986). This motion is in the opposite direction in the southern hemisphere for the same sign of By (Craven et al., 1991). Although the sun-aligned arcs are of much larger scale (and weaker) than the typical arcs found in the auroral oval, the word 'arc' is appropriate in one sense: at least sometimes they show signatures of inverted-V type electron spectra, indicating similar field-aligned acceleration than seen in other discrete aurora (Frank et al., 1986). It has been argued that the arc is most likely located on closed field lines, and connected to distant plasma sheet or its boundary layer (PSBL; see, e.g., Menietti and Burch, 1987). Note that if polar cap is defined as a region of open field lines, sun-aligned arcs are not anymore 'polar cap' events! The formation of a sun-aligned arc requires a prolonged period of non-positive IMF Bz, and a subsequent change in either Bz or By component (Newell and Meng, 1995; Chang et al., 1998). They are most likely caused by changes in the merging rates in the dayside magnetopause affecting the global plasma convection. See Rodriguez et al. (1997) for discussion of arc decay after southward turning of IMF, delay being 15-30 minutes. For something as dynamic as the aurora borealis, acting up is normal. But even it can behave in ways that are simply odd. "It's an interesting problem that I came upon last year," explained Dr. James Spann, a solar-terrestrial physicist at NASA's Marshall Space Flight Center. Spann is also a co-investigator on the Ultraviolet Imager, a special camera aboard the Polar spacecraft. With UVI, scientists can observe the aurora borealis on the day and night side while the spacecraft is over the northern hemisphere. Today he describes unusual transpolar auroral arcs at the annual spring meeting of the American Geophysical Union in Boston. Colleagues working with him are Glynn Germany of the University of Alabama in Huntsville and George Parks of Washington University. A transpolar arc is barely visible in this UVI image of the aurora on Jan. 11, 1997, at 07:50:32 UT. Links to 293x258, 74Kb GIF. Credit: NASA/Marshall Space Flight Center. The aurora acts like a TV picture tube painting out images on the Earth's upper atmosphere. The electron gun in this picture tube is the magnetosphere, the immense baggy region of space where the Earth's magnetic field traps charged particles. When the magnetosphere is energized, electrons and ions are squirted from the tail region towards the magnetic poles. "We observed polar arcs form from both the dusk and dawn sides and co-exist in the polar cap at the same time," Spann said. "The models we have of the magnetosphere don't explain all the features that we observed." The first such an event - called the Theta aurora - was recorded by the imager aboard the Dynamics Explorer 1 satellite in 1985. In this event, named after the Greek letter it resembled, the aurora developed a distinct bar that moved from one side of the polar region to the other. More than an hour later, at 09:25:36 UT, the circular aurora does not link with a faint transpolar arc. Links to 293x258, 74Kb GIF. Credit: NASA/Marshall Space Flight Center. In the event Spann saw, the aurora had two weak crossbars, one that spanned the polar region, and one that extends into it but fails to make a clear connection on the other side. "The other thing that's very interesting is on one of these features we see energy propagating towards the dayside along the arc," Spann said. "It's not clear that we've seen that before." "For these polar arcs to even exist there has to be some specific conditions in the magnetosphere to let the field lines penetrate the Earth's surface through the center of the polar region," Spann said. "We are seeing a record of a dynamic event in the magnetosphere." Just to keep him and his colleagues guessing, the aurora acted up again the next day. "A large magnetic cloud came by in the solar wind, we saw electron precipitation at the poles, and then we saw the onset of a substorm," he said. "We saw faint remnants of a transpolar arc which then brightened. So, this storm's onset feeds the transpolar arc." An hour later, events took a different turn. "Then another substorm kicks in, but it's confined to the oval and ignores the transpolar arc," Spann said. "With two substorms separated by an hour, something has changed in the magnetosphere and caused these things - the storm area and the transpolar arc - not to talk to each other." The figure to the right shows a polar view of the northern hemisphere on which one set of convection observations from SuperDARN are superposed. The solid and dashed contours represent the paths of plasma circulation. The colored lines represent velocity vectors in regions where SuperDARN measurements were available. Both the contours and the vectors are derived from the observations. In this example, yellow vectors represent velocities in excess of 1 km/s. Noon is toward the top of the plot and midnight is toward the bottom. The grayed portion of the map is in darkness. It can be seen that the velocity vectors have a generally antisunward orientation over the polar cap and are directed sunward at lower latitudes. This type of circulation is commonly referred to as a two-cell convection pattern. Electric field from solar wind/IMF system is mapped (either directly or via magnetosphere) to the high-latitude ionosphere, creating horizontal E × B plasma drift called convection. The actual convection pattern seen depends on the direction of IMF. See also solar wind - magnetosphere - ionosphere coupling. In the simplest case, occurring during southward IMF, the F-region plasma flows antisunward over the polar caps (open field lines, i.e., solar wind regime), and returns sunward within the auroral oval (closed field lines, i.e., magnetospheric regime). This creates the two cell pattern relating to the convection electrojets in the highly conducting auroral region (see, e.g., Clauer and Kamide, 1985; also term ionospheric DP 2 or "disturbance polar of the second type" current system has been used). The two cell pattern is most clear during the substorm growth phase. In terms of electric fields, we have duskward pointing field over the polar cap, and dawnward field at the auroral latitudes. The situation is more complex during northward IMF: the ionospheric convection is much more structured, confined to much higher latitudes (polar cap is smaller), and velocities are of smaller magnitude than in the case of southward IMF. Reconnection is possible only between the IMF and the open field lines of the magnetotail. This results in four cell or three cell ionospheric convection pattern for strongly or weakly northward IMF, respectively. It is usually thought that the high latitude cells (that are on open field lines all the time) are due to reconnection, and the low latitude cells are formed due to viscous interaction (Axford and Hines, 1961). In this process the momentum of the magnetosheath plasma is transmitted across the magnetopause by waves and diffusion, creating an effective viscosity. The untisunward convection takes place in closed field lines in equatorial boundary layer. The return flow towards the sun occurs on lower latitude field lines and is driven by back pressure in the magnetosphere near midnight. Observations of just the ionospheric convection signature cannot distinguish between viscous and reconnection based convections, but the measured high cross-polar cap potentials and the dependence of the convection geometry on IMF By suggest that the merging process dominates over viscous interaction when the IMF has a southward component. However, during northward IMF the relative importance of the viscous interaction is larger. Changing By creates asymmetry in the dawn-dusk direction, as the figures above show. See, e.g., Reiff and Burch (1985). Apparent drift motion of polar cap arcs may be indicative of plasma convection processes in the ionospheric plasma. The dynamics of a number of individual polar cap events observed by a dual wavelength allsky imager at Scott Base have been analysed in detail. The imager, which records optical emissions at 630 nm and 428.7 nm has been operated at Scott Base, (-79.96°, 327.61° magnetic), during the winters of 1996 to 1998. The events presented have been selected to show representative examples of arcs observed primarily in the dayside. Of interest is the speed and direction of the polar cap arc drift motion with respect to solar wind and interplanetary magnetic field conditions. Events were observed between 10:00 and 19:00 local time (mid-morning to dusk), where drift velocities varied between 60 m/s away from the invariant pole and 1000 m/s polewards. Another example shows a drift velocity of 300 m/s perpendicular to the pole direction. Each of the examples shows different velocities and drift direction, for differing solar wind conditions, and different times. The small number of images in the initial data set needs to be expanded into a full three year data set, and include data from other instruments, in order to fully understand the correlations of polar cap arc drifts with solar wind/interplanetary magnetic field (IMF) conditions. The observation of optical auroral forms that occur in the polar cap has led to the identification, and naming, of a wide range of emissions including: polar cap arcs, extremely high latitude auroras, sun aligned arcs, transpolar arcs, horse collar auroras, and theta aurora. It is difficult to interrelate these as they have been defined by various authors under a wide range of conditions and over a period of observations that began in 1907. 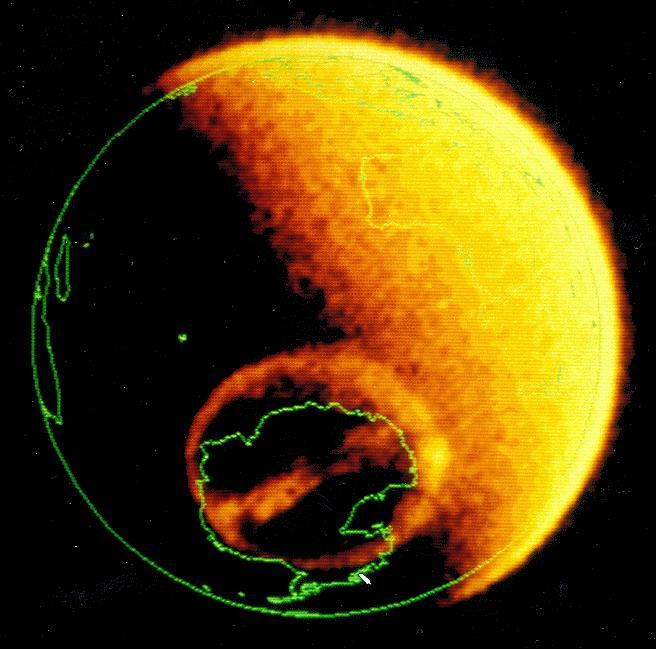 In a recent review paper, Zhu et al.,  use the term polar cap arc to differentiate aurora seen in the polar cap or poleward of the auroral oval from auroral oval emissions. Unlike auroral zone arcs these are seen more during northward IMF and quiet magnetic conditions . Early observations, made visually, and by film based allsky camera, identified properties of polar cap arcs including the Sun-Earth orientation, transverse motions, the occurrence only at high latitude, and the negative correlation with magnetic activity. Continued observations of high latitude optical emissions are needed to resolve questions about their relationship to open/closed field lines, and equally importantly, to the ionosphere convection that accompanies them. This study uses images of polar cap aurora acquired at Scott Base to investigate the scale, the motions, and dynamics of these phenomena to examine these questions. In particular the behaviour of small scale, relative to the polar cap, arcs of less than 1000 km length are noted. The Allsky data recorded over the Antarctic winters has provided many images where the aurora has been well enough defined, and of sufficient intensity, to make reasonable deductions of spatial and temporal characteristics using the altitude assumptions mentioned above. The motion of polar cap arcs may display an aspect of overall ionosphere convection , or they may be quite localised. Examples of polar cap auroras discussed here have been selected for events displaying a definite drift motion. The prevailing IMF conditions (projected from upstream), which indirectly drive ionospheric convection are also presented for these events. These examples show polar arc drift motion can be quite varied. Figure 4 1996 June 20. (a) raw data image; (b) arc positions; (c) WIND MFI data. On this day between 23:23:00 and 23:31:30 UT, as shown in figure 4, a very bright, broad, roughly sun aligned arc formed from the SSE, where it was attached to the auroral oval, extending to the NNW. It moved poleward, (to the west) as a loop, and then collapsed to the south within 6 minutes. At the south east, where this arc was connected to the auroral oval, it did not show much movement. The auroral oval, which should be seen in the lower left of the images is partly obscured by icing inside the dome. The thumbnail, figure 4(a), shows the raw image of 23:27:00 UT, and the composite negative image, (b), shows the positions of the arc every 30 seconds, moving from east to west for the period in the red image. The blue image (right side) shows positions of the arc between 23:25:00 and 23:28:30 UT. Here is an example of the blue image apparently switching on and off, as mentioned above. Assuming an altitude of 250 km for the red emissions, the westward velocity was 500 ±80 m/s over the centre of the field of view. At this time the direction to the sun is just east of north, and is indicated by the arrowhead. Figure 4(c) shows the solar wind conditions from the WIND spacecraft Magnetic Field Instrument (MFI) data. The vertical line labelled 23:24 eq relates to the conditions expected at the Earth at the time of the event, taking into consideration the prevailing solar wind velocity and travel time to the magnetopause. Kp was 1-, Bz was weakly positive, having been so mostly for the previous hours, By was also weakly positive, Bx at 23:24 eq was negative. The total B field was about 5 nT. There were two other similar arc events, with similar short lives, though not as intense, during the period 22:00 June 20 to 00:35 June 21, around mid day local time, with drift motion towards the invariant pole. Figure 7 1998 July 7. (a) raw data image; (b) arc positions; (c) WIND MFI data. This arc, shown in figure 7 moved north at about 300 ±40 m/s from 06:50 UT to arrive overhead at about 07:02 where it remained until fading into cloud/interference. This corresponds to 19:00 local time, around dusk. The thumbnail figure 7(a) shows the raw data at 07:05 UT. There is no information in the blue image due to the presence of the moon. (A small spot visible 180° from the moon in the red image is a reflection of the moon from the inside of the spherical dome). In the composite image, figure 7(b), the positions at 2 minute intervals from 06:50 until 07:16 UT are shown. This arc is again essentially aligned with the sunwards direction, the sun being west-south-west at the time. The solar wind data are shown in figure 7(c) with the projected time of the arc onset marked. The Btot field is greater than the previous examples at around 10 nT and is more variable. Bx was between 8 nT and 5 nT for the preceding period, and remained positive. By was strongly negative at -10 nT, and had been negative for some time. Bz shows a sudden increase from around 1 nT to 6 nT at the start of this event. However as the viewing conditions were not perfect it is not possible to know if we have detected the actual birth of this event, or if it became visible after it was established. The drift velocities of the first three arcs presented here were, 500 m/s poleward, 200 m/s anti-poleward, and a "rotating" arc with up to 1000 m/s poleward motion, all recorded around local noon. The relation of the By direction to the poleward/anti poleward drift motion in these specific examples is in agreement with the findings reported by Valledares et al., , that the east-west component of the IMF can control drift motion. The fourth event, from 0700 UT (local dusk), shows a drift of 300 m/s northwards which is unrelated to the poleward direction. This arc is aligned with the sun direction. As stated before, all the polar cap arc examples presented here, and observed so far in the study are associated with northwards IMF. This is expected from reports in all the previous literature. The rotation of polar cap arcs is not well documented. The four examples here were selected to show that there are several differing drift motion regimes. Detailed examination of the other identified events in our data is needed to establish trends. The images selected here represent some aspects of polar cap arc phenomena. Our data does contain aurora from the oval, and arcs that can be sufficiently long in extent to span the entire field of view. The straight or nearly straight localised arcs, aligned sunwards, or to the cusp (Valledares et al., 1994) direction described here are unique to polar cap conditions. Specific examples that occur when reliable satellite data on IMF and solar wind are also available, are therefore potentially useful to examine in detail. It is not clear whether these arcs occur on magnetic field lines that are "open" to the interplanetary magnetic field, or field lines that map back into the magnetotail. Where the field lines map depends on the model of convection that applies, and more evidence is needed to justify either or both propositions. This paper presents preliminary observation results and the relation of these events with IMF By, Bx, and solar wind conditions will be expanded. Specific events will be related to data from magnetometers, riometers, and other photometers from the polar cap PENGUIn and AGO program and ionospheric convection patterns. (Based on Newell and Meng, Science, 270, 1338, 1995). Simultaneous DMSP auroral particle measurements, Polar BEAR uv images, and IMP-8 IMF measurements, show that the hypothetical theta-aurora configuration of open-closed-open field lines really does occur (that is, a special class of "theta-aurora" which are distinct from the typical sun-aligned arcs exists). Arcs widely separated from the oval and surrounded by polar rain occur during the reconfiguration of the magnetosphere-ionosphere system which follows a southward turning of the IMF after a long or intense period of Bz>0. The sun-aligned arcs do form for northward IMF conditions as previously reported [Valladares et al., 1994], but do not widely separate from the oval until after a southward turning occurs. For these examples and others, simultaneous DMSP charged particle measurements are available to confirm that the bar really does represent closed field line plasma (it closely resembles the plasma from the poleward portion of the auroral oval) surrounded by open field lines (either empty or more commonly a weak polar rain). When merging begins to transport significant amounts of flux from the dayside to the nightside, the newly opened flux must move primarily along the open/closed field line -- i.e. azimuthally, not poleward. This is true both observationally [e.g., Heelis et al., 1984] and theoretically [Southwood, 1987]. As a result newly opened flux convects inside the flanks of the sun-aligned arc, coverting it into a true theta-aurora. A final point: a theta is a circle with a bar through it. In the images presented here, and in the image presented on the back cover of GRL (September 1982), the oval is circular. A circular oval is typical of southward IMF conditions; for northward IMF the shape is more of a horse collar or tear drop shaped. Good examples of the horse collar shape in both particle data and imagery can be found in the work of Hairston. Note that under the restrictive definition we propose for the term "theta-aurora", the Hairston cases would no longer be given this name. 2. "open" field lines, near the magnetic poles, which come out of the Earth and connect up to the solar wind. At the interface between open and closed field lines dramatic plasma physics processes occur, including the ring of light forming the auroral oval ( Story 4 ). In 1982, Professor Frank of the University of Iowa, using ultraviolet images taken from the NASA satellite DE-1, reported a dramatic effect: inexplicably, a bar moved out from one side of the oval into the center of the polar cap, bifurcating the oval. Many scientists, including the present authors, were skeptical whether this effect was real. It is known that when the interplanetary magnetic field points in the same direction as the Earth's field (northward) the oval shrinks because fewer field lines are connected to the solar wind (explained in Story 3). As the area of open field lines shrinks, the image can look like a theta, even though the open field line region is not bifurcated (especially since the imagers are not particularly sensitive). In fact there is no doubt that some cases of "theta-aurora" studied by scientists really are of this more mundane type. Actually even Frank and co-workers assumed that their theta-aurora occurred for northward IMF, since most really high-latitude arcs do. Even textbooks began to say so! Another new set of measurements which are complementary and prove to be key in understanding the puzzle come from the Air Force DMSP series of satellites (which are mainly designed so that the military can have its own private weather forecasting, but they let space scientists study "space weather"). These satellites measure the charged particles from space which cause aurora. The particle data from these Air Force satellites proves that the theta in the images really do have the weird open/closed/open configuration. (The first "spectrogram" shown below is of the particles measured by a DMSP satellite at the same time as the image at the top of the page.) These "spectrograms" show that the isolated arcs really do consist of plasma from the closed field lines of the magnetotail surrounded by polar rain. Polar rain is the hottest part of the solar wind (see story 3 ). Therefore we now know that a theta really is an open-closed-open configuration, with plasma from the nightside of the Earth surrounded by field lines going out into the solar wind! How does it happen? It turns out that this weird situation occurs during a re-configuration of the near-Earth space regions (the magnetosphere) which occurs when the interplanetary magnetic field flips sign from pointing in the same direction as the Earth's magnetic field (which is northward) to pointing opposite to the Earth field (southward). July 24, 2008: Duck! Plasma bullets are zinging past Earth. That's the conclusion of researchers studying data from NASA's five THEMIS spacecraft. The gigantic bullets, they say, are launched by explosions 1/3rd of the way to the Moon and when they hit Earth—wow. The impacts spark colorful outbursts of Northern Lights called "substorms." "We have discovered what makes the Northern Lights dance," declares UCLA physicist Vassilis Angelopoulos, principal investigator of the THEMIS mission. The findings appear online in the July 24 issue of Science Express and in print August 14 in the journal Science. The THEMIS fleet was launched in February 2007 to unravel the mystery of substorms, which have long puzzled observers with their unpredictable eruptions of light and color. The spacecraft wouldn't merely observe substorms from afar; they would actually plunge into the tempest using onboard sensors to measure particles and fields. Mission scientists hoped this in situ approach would allow them to figure out what caused substorms--and they were right. The discovery came on what began as a quiet day, Feb 26, 2008. Arctic skies were dark and Earth's magnetic field was still. High above the planet, the five THEMIS satellites had just arranged themselves in a line down the middle of Earth’s magnetotail—a million kilometer long tail of magnetism pulled into space by the action of the solar wind. That's when the explosion occurred. A little more than midway up the THEMIS line, magnetic fields erupted, "releasing about 1015 Joules of energy," says Angelopoulos. "For comparison, that's about as much energy as a magnitude 5 earthquake." Although the explosion happened inside Earth's magnetic field, it was actually a release of energy from the sun. When the solar wind stretches Earth's magnetic field, it stores energy there, in much the same way energy is stored in a rubber band when you stretch it between thumb and forefinger. Bend your forefinger and—crack!—the rubber band snaps back on your thumb. Something similar happened inside the magnetotail on Feb. 26, 2008. Over-stretched magnetic fields snapped back, producing a powerful explosion. This process is called "magnetic reconnection" and it is thought to be common in stellar and planetary magnetic fields. The blast launched two "plasma bullets," gigantic clouds of protons and electrons, one toward Earth and one away from Earth. The Earth-directed cloud crashed into the planet below, sparking vivid auroras observed by some 20 THEMIS ground stations in Canada and Alaska. The opposite cloud shot harmlessly into space, and may still be going for all researchers know. The THEMIS satellites were perfectly positioned to catch the shot. "We had bulls-eyes on our solar panels," says THEMIS project scientist David Sibeck of NASA's Goddard Space Flight Center. "Four of the satellites were hit by the Earth-directed cloud, while the opposite cloud hit the fifth satellite." Simple geometry pinpointed the site of the blast between the 4th and 5th satellite or "about 1/3rd of the way to the Moon." No damage was done to the satellites. Plasma bullets are vast, gossamer structures less dense than the gentlest wisp of Earth's upper atmosphere. They whoosh past, allowing THEMIS instruments to sample the cloud’s internal particles and fields without truly buffeting the satellite. This peaceful encounter on the small scale of a spacecraft, however, belies the energy deposited on the large scale of a planet. The bullet-shaped clouds are half as wide as Earth and 10 times as long, traveling hundreds of km/s. When such a bullet strikes the planet, brilliant auroras and geomagnetic storms ensue. "For the first time, THEMIS has shown us the whole process in action—from magnetic reconnection to aurora borealis," says Sibeck. "We are finally solving the puzzle of substorms." The THEMIS mission is scheduled to continue for more than another year, and during that time Angelopoulos expects to catch lots more substorms--"dozens of them," he says. "This will give us a chance to study plasma bullets in greater detail and learn how they can help us predict space weather." "THEMIS is not finished making discoveries," believes Sibeck. "The best may be yet to come." Last edited by nick c on Thu Mar 24, 2011 4:12 pm, edited 1 time in total. Granted they continue to invoke the long-defunct "magnetic reconnection" rather than acknowledge an underlying electrical structure to the event. Does not a "magnetic explosion" come from an underlying "electric current explosion?" Perhaps an exploding double layer or some other large discharge event? Why must astronomers constantly reinvent the wheel just to avoid saying the taboo words "electricity," "electric current," "electrodynamics," etc? Might not the "magnetic explosion" have an underlying electrical cause (seeing as magnetic fields only spring from electric currents, thus implying that a dramatic rise in magnetic fields was in fact due to a dramatic rise in input current strength)? Dec 12, 2007: Northern Lights' Source Found in Giant "Magnetic Ropes"
and my response to a brief question about the "ropes"
I wrote: The "ropes" are a 650,000 Amp electric current flowing between the Earth and the sun. God, I'm tired of hearing about "magnetic reconnection." It's a CURRENT, let's get it right! The twist of the magnetic fields follow the twist of the electric current in the interplanetary space plasma. Electrical currents in plasma tend to form filamentary strands, much like those seen regularly in novelty plasma globes. Magnetic fields are ONLY sources from electric currents, and disappear when the current is quenched. What about permanent magnets, you say? The electric currents are on the atomic level (IE, electrons circling atomic nuclei in lockstep with other electrons circling other nuclei). The curie point (where "permanent" magnets lose their magnetic properties) is simply the point at which the lockstep of electrons is broken due to increasingly disorganized, random, chaotic motions caused by the increases in kinetic energy of the charged particles and the atoms themselves. Anyway, if you don't believe that the flux ropes are actually a current, see nasa's own press release and the associated multimedia. Search google for "Multimedia for the Press Event for THEMIS." Should be the first result. View "Image 10: Flux ropes power the magnetosphere. THEMIS discovered a flux rope pumping a 650,000 Amp current into the Arctic." The truth is buried in the multimedia accompanying the main release, which fails to mention anything about electric currents or the fact that this was predicted circa 1908 by Kristian Birkeland in his scientific monograph: The Norwegian Aurora Polaris Expedition 1902-1903. Over the past 30 years, some scientists have believed that a disruption in the current of charged particles — similar to the blowing of an electric fuse, the scientists said — about one-sixth of the distance from the Earth to the Moon’s orbit was responsible. Others believed it was a snapping of magnetic field lines farther out, about one-third of the distance to the Moon. To answer the question, the Themis mission launched five identical satellites, each about the size of a washing machine, to measure the electric and magnetic fields as well as the particles passing by at different locations around Earth. Coupled with ground observations, scientists were able to deduce the order of events in a substorm in February. The snapping of magnetic fields occurred first, followed by a burst of auroras. Surprisingly, the disruption in the charged particle current occurred after the aurora. Proponents of that hypothesis had thought that the magnetic snapping caused the change in electric current and that, in turn, led to the auroras. “This defies our old paradigms,” Dr. Angelopoulos said. They are sure magnetic reconnection has been observed. I say they saw a harmonic resonante mode event not a magnetic reconnection event. Why do I say this? Lab experiments. It seems more plausable what in fact they observed was a harmonic resonate oscillation at a double layer with two opposite symmetrical plasma bullets produced as this is reproducable in the lab while magnetic reconnection has never been demonstrated at any time in any lab. I have always felt since one month after I first learned of the EU that it must be longitudinal transmission and have millions of resonate modes....well a IEEE paper states this is so concerning the millions of modes. I say they are longitudinal because they shake the earth, a Tesla concept with longitudinal waves and the Impulse Magnifyer Transmitter. systems as they operate on Earth, in the oceans and in space. ABSTRACT | This paper describes some unanticipated effects of the normal modes of the sun on engineering and scientific systems. We begin with historical, scientific, and statistical background, then present evidence for the effects of solar modes on various systems. Engineering evidence for these modes was first noticed in an investigation of communications satellite failures and second in a study of excessive dropped calls in cellular phone systems. The paper also includes several sections on multitaper estimates of spectra, canonical coherences, robust, and cyclostationary variants of multitapering, and related statistical techniques used to separate the various components of this complex system. In our attempt to understand this unexpected source of problems, we have found that solar modes are detectable in the interplanetary magnetic fields and energetic particles at the Ulysses spacecraft, five astronomical units from the Earth. These modes couple into the magnetosphere, the ionosphere, the geomagnetic field, and atmospheric pressure. Estimates of the power spectrum of data from solar radio telescopes and induced voltages on ocean cables show what appear to be solar modes at both lower and higher frequencies than the optically measured solar p-modes. Most surprisingly, these modes are easily detected in seismic data, where they literally shake the Earth. I wonder if NASA was able to correlate the plasma current spike (imaginary re-connection) Themis readings with ground-level total geomagnetic field variations? I just saw this on SPACE.COM. There weren`t any magnetic bullets mentioned, but still it said they proved magnetic reconnection... pretty sad, since I really had my hopes for the THEMIS mission to help prove EU.